Before it was one of the greatest films of the 1970s, Jaws was a pretty entertaining novel about a great white shark eating people off the coast of the fictional town of Amity Island, New York. Spielberg’s film is one of those rare examples of a movie actually being better than the novel it was based upon (if only because it thankfully jettisoned the ill-conceived affair between Matt Hooper and Mrs. Brody – yes, that actually happened), but it’s still a pretty fun read. 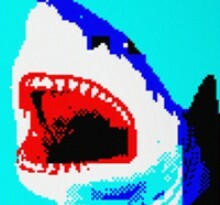 Jaws has also been the subject of several video game adaptations (a genuinely terrible Nintendo game and a marginally more fun Xbox and PS2 title are in the distant past, as well as a terrible Nintendo Wii game of more recent vintage), but no one’s quite managed to merge the campiness of Peter Benchley’s novel and the world of video games – until now. Matt Round, an indie game developer, has crafted a loving ode to not only Jaws, but the text adventures of old with his new title Jaws: The Text Adventure. There’s a catch, though – instead of playing Chief Brody or Quint and trying to save Amity from the marauding apex predator, you will instead play Bruce himself – on a journey to figure out the meaning of life and fill your belly with tasty tourists. Fans of the film will find plenty of nods to it in the various text-based interactions, while fans of classic text adventures will find themselves gleefully inputting various commands in different scenarios just to see what happens. My advice? Try kissing Chrissie Watkins instead of chomping her to bits. See where that gets you. Head on over to UsVsTh3m to check out the fruits of Round’s labor – we think you’ll find it pretty entertaining.